Next week, worlds will collide as “New Girl” and “Brooklyn Nine-Nine” are about to have its very first crossover event on FOX. 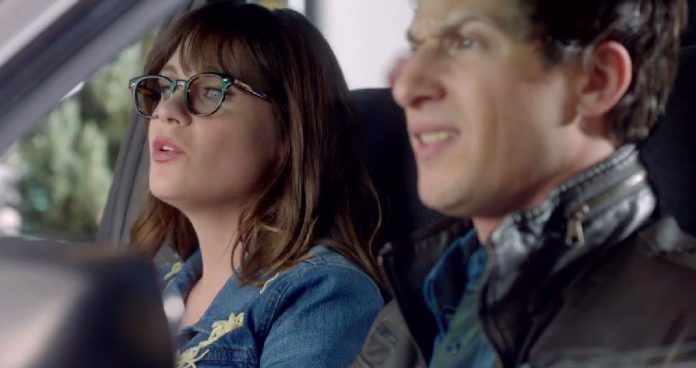 Ahead of the wacky episode, the network released the first promo for the special which sees Jess (Zooey Deschanel) and Jake (Andy Samberg) working together on the streets of New York. In the promo, Jake taps on Jess’ car and says that he needs to commandeer the vehicle. “It’s a crassover!” Jess quips. Later, the two are seen hurtling through traffic with Jake at the wheel, and Jess screams in fear as she clutches her cup of coffee. 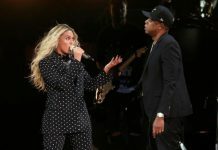 According to the official description of the episode, the crossover begins on “Brooklyn Nine-Nine” when Jake encounters a visiting Jess and asks her to help him track a suspect. The action carries over to “New Girl” when Jess visits the 99th Precinct and meets Gina (Chelsea Peretti) and Captain Holt (Andre Braugher). The second half of the crossover will also see the whole “New Girl” gang head to New York because Schmidt (Max Greenfield) believes he is being honored at his high school. As for Nick (Jake Johnson) and Winston (Lamorne Morris), the two try to find subway fare while attempting to impress Boyle (Joe Lo Truglio), and Cece (Hannah Simone) comes face-to-face with her new mother-in-law (Nora Dunn). “New Girl” executive producer and showrunner Brett Baer previewed the crossover special, telling TVLine that some unplanned fun takes place when Jess is tasked to buy some soup from Schmidt’s favorite deli, which happens to be within the vicinity of the 99th Precinct. As she’s on her way to get the soup, Jess has a run-in with various members of the Brooklyn squad. Baer also revealed that while New York has never been Jess’ favorite city, she went along with the gang to make sure that Schmidt will have a great time. The crossover event starts on “Brooklyn Nine-Nine” on Tuesday, Oct. 11 at 8 p.m. ET and continues on “New Girl” at 8:30 p.m. ET on FOX.